Flood information for the Alpine Shire Council, encompassing local flood guides for Myrtleford (in English and Italian) and the Alpine Shire Council Municipal Flood Emergency Plan. Alpine Shire Council has a history of flooding including a significant flood event in October 1993 which impacted the townships of Bright, Harrietville, Kiewa Valley, Myrtleford and vast rural areas- resulting in extensive damage to homes, infrastructure and the community. Significant flood events also occurred in 1998, 2010 and to a lesser extent, 2016. Flooding usually occurs as a result of moderate to heavy rainfall across the municipality causing breaching of the Ovens and Kiewa Rivers. The onset of flooding is usually rapid due to the steep slopes of the surrounding ranges and often causes isolation due to closure of the Great Alpine Road. The lead time to respond to a flood event in the Alpine Shire may be limited. All households and businesses at risk of flooding should beware of their specific flood risk and develop an emergency plan. Households and business should refer to the Myrtleford Local Flood Guide (Available in English and Italian) or Municipal Flood Emergency Plan for more information. Contact the North East Regional Headquarters. Visit the North East Catchment Management Authority website. 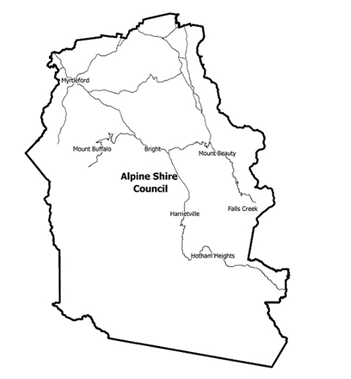 Visit the Alpine Shire Council website.